All Instrumental Button Accordion with various artists from Europe! All Instrumental Button Box Accordion direct from Europe on this CD! 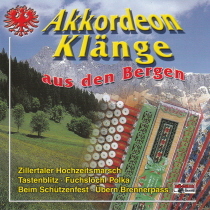 “Akkordeon Klänge aus den Bergen” is Volume 1 of outstanding instrumental button accordion by some of the best button box accordion players in Europe. Don’t pass this CD!